With its unique theme song by Tyler, the Creator, clever humor, and colorful animation, the film breaks down boundaries of age to entertain parents and kids alike. The classic Christmas story, narrated by Pharrell Williams, is a more kid-friendly spin off of its live-action relative, “How the Grinch Stole Christmas.” If you’ve seen the other Universal film, you might expect the mean, green, Christmas-stealing monster to be sinister and scary. However, in this adaptation, the animated antihero is easier to digest for younger audiences. Illumination did a great job of showing his disdain for the Whos and the holiday season without creating a character that might haunt them when they leave the theater. The Grinch himself is played by Benedict Cumberbatch, who is often seen in darker, more mature productions such as BBC’s “Sherlock” or Marvel’s “Avengers.” The British actor is taken less seriously in this film, and I found his voice much less dramatic when he’s feigning an American accent. The Grinch gets a whole new backstory in this tale, compared to the live-action version. His resentment for the snow and Christmas decorations come from the trauma he experienced growing up in an orphanage, a heavy theme that Universal handles very tastefully. They drop subtle messages about coping with pain and having healthy friendships, which are important lessons delivered simply enough for the film’s intended PG-rated audience. Cindy Lou Who, if you remember, is the character who eventually returns the Grinch’s heart to its normal size. In this film, she is the oldest child of her mother, a single nurse working the night shift and raising a family. Cindy Lou wants nothing more than her mother’s happiness, so she and her friends develop an elaborate plan to trap Santa so she can talk to him about this Christmas wish face-to-face. Of course, Cindy Lou ends up talking to Mr. Grinch himself, showing him that the true meaning of Christmas is not wrapped in boxes or hung on a tree. It’s in the fellowship around the table and the songs they all sing together. Despite these heavier themes, Illumination provides enough clean comic relief via its animal characters. Mr. Grinch’s only companion is his dog Max, who is a sassy sidekick. They also encounter an overweight reindeer named Fred, who provides some slapstick humor here and there to lighten the mood. The humor is tastefully placed, but for older audiences, it might get old. I found myself not paying attention after a while, as the film simply wasn’t stimulating enough to keep my focus for an hour and 45 minutes. This being said, the film is intended for families with younger kids, not for college-aged people alone. In most movies intended to entertain the entire family, there is often a moment of crude humor that pushes the envelope. In this film, I noticed none of that. All humor was goofy or clever, leaving out any inappropriate innuendos. 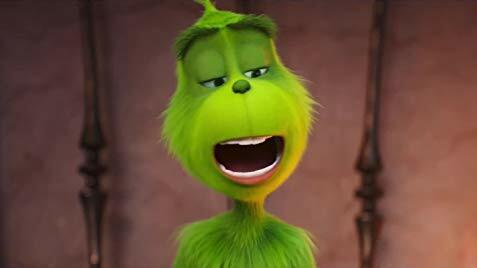 Despite its pre-Thanksgiving release, “The Grinch” was a film that warmed hearts just in time for the Christmas season. The film is set to hit theaters on Nov. 9.